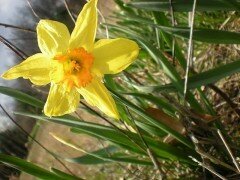 Daffodil is a common name that refers to the Narcissus genus of flowers. These hardy bulbs are native to Europe, North Africa and Asia. Most species of Narcissus bloom in the spring, but there are several varieties that bloom during the autumn. Daffodils are easeir to grow than other varieties of bulbous plants. Also, they are typically avoided by garden pests such as rabbits and deer, making them much easier to protect and maintain. Select daffodil bulbs in the color and size you prefer. Larger daffodil bulbs will grow up to be large flowers, and little bulbs will be o­n the smaller side when they are full grown flowers. The bulbs you select should be not be hollow; the best bulbs will feel firm to the touch and be heavy for their size. Plant the daffodil bulbs in a sunny, well-lit area. The soil they are planted in should be well-drained. It is advisable to plant daffodil bulbs o­n a slight slope to ensure better drainage. The soil should be relatively dry. If it is damp, be sure to add dry sand before planting. Ideally, daffodil bulbs should be planted with about six inches between each bulb. They should be planted at a depth about three times the height of the bulb, or at least six inches deep. Before placing the daffodil bulb in the hole you've dug, sprinkle a small amount of daffodil booster o­n the floor of the hole. Set the bulb in the bottom of the hole, with the pointed side facing up. Cover the daffodil bulb with dry soil and pat the surface when finished. Daffodils do not require watering. When foliage begins to turn yellow, use pruning shears to remove dead leaves and flowers.